To say that many of my tastes were influenced by the tastes of my parents is to severely understate the obvious. I was a child raised by somewhat trendy parents. You should see photos of my father's dashiki, my Mom's blonde Afro, and the beaded braids I was forced to endure. Bell bottomed pants, Sergio Valente's, newsprint outfits, jelly shoes, if it was a fad in NY, I endured it. These trends were not limited to fashion. It bled right into musical tastes, and Television programming. Seeing as though we had one television until I turned 6 only helped further my Patty Hearst-like brainwashing. If my mother wanted to watch it, I *had* to watch it as well. Since my father came home from his second job long after I went to sleep, his influence was focused to my love of the New York Yankees, and Hulk Hogan on Sundays. One of the many shows my mother would watch was Welcome Back Kotter, starring the young John Travolta. My mom loved John Travolta. 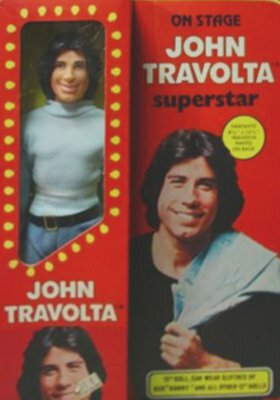 It's no surprise that on a shopping trip to purchase a Barbie-like doll (most probably a knock off blow mold doll), my mother became distracted by the new John Travolta celebrity doll display. I remember seeing the most awesome Adventure Team Muscle body GI Joes, and really wanting them. The packaging was bright, and since they were sold in shorts, you could see their superheroic physique. Bulletman appealed to me. John Travolta appealed to my mom. My mom convinced me I would much rather prefer the John Travolta doll. He was on TV, movies, etc. So I walked out the door with John Travolta. But my mom DID surrender on one point. I wanted an army guy, so she agreed I could get John an army outfit, complete with jungle camo, boots and rifle. When I got home I was actually excited to play with my new stuff. I opened the box and pulled John free, ripped open the army gear, and got ready for adventure! The adventure was short-lived. Getting John out of his light blue shirt and denim combo turned out to be quite the task for a 4 year old. His pants and shirt were actually a onesy, and the belt was flimsy. My mom helped after noticing me struggle and offered to put his army suit on for me. That was a different struggle. Travolta was larger that your average Joe. My mom did manage to get the shirt and pants on, but it looked like he was wearing camo Capri pants that left nothing to the imagination, and his shirt would not close. His rifle looked like a BB gun, and his boots would not fit. I was pretty disappointed in the whole deal. Finally I asked my mom to put his regular clothes on. I guess his only adventures would occur on the dance floor... solo, since I never did get a Barbie or Barbie like doll on that shopping trip. I did finally get a Barbie doll, two years later. She was actually a Skipper doll, which was way too short for John. But that's a story for another day.